Your makeup, face cream, skin moisturizer, or cleanser may deliver short term smoothness and brightness, but it may disrupt your hormones and fertility, expose you to known cancer-causing pesticides, and deliver dangerous toxins that penetrate and age your skin. That’s right. The cosmetics you use may actually speed the formation of wrinkles, age spots, and worse. You might think if these industrial chemicals were that bad they’d be banned. Well, in fact many are…in Europe. European authorities have banned more than a thousand of these chemicals. In the US, the FDA has banned eight. To protect your skin and keep it looking young, firm, and bright, look for these chemicals in all skin care products – and avoid them. Used to lighten skin, BHA and BHT are considered by the National Toxicology Program as a likely carcinogen. In studies, animals exposed to these chemicals developed stomach cancer and liver damage, and developed problems with their thyroid and reproductive organs. Banned in Europe. These chemicals interfere with hormones and cause infertility in men. Regular exposure is linked to low sperm counts. It absorbs easily through the skin and is used in diaper creams. Banned in Europe and Canada, and the cosmetic industry states it’s unsafe for infants. You can find coal tar still used in hair dyes and dandruff and psoriasis shampoos. It’s recognized as a carcinogen by the International Agency for Research on Cancer. On ingredient lists, it goes by aminophenol, diaminobenzene, and phenylenediamine. Another known cancer causing agent, formaldehyde also harms the brain, interferes with growth and development in children, and induces asthma. These preservatives slowly release formaldehyde to keep the skin care product from spoiling. These often trigger allergic reactions on the skin. If you’ve ever experienced a contact allergy after using a skin lotion, it probably had one of these ingredients: DMDM Hydantoin (very common), diazolidinyl urea, imidazolidinyl urea, methenamine, and quaternium-15. You know mercury is bad, but some cosmetics use it to lighten the skin. It absorbs easily through your skin and with enough use can develop into mercury poisoning. Steer clear of products with “calomel”, “mercurio”, “mercurio chloride” or just plain old “mercury”. Another skin lightener, it causes a skin disease called ochronosis that features black and blue lesions that can become permanent. In animals, studies have found enough exposure leads to tumor development. Sunscreens use oxybenzone to absorb UV light. In humans, this chemical causes skin irritation and allergic reactions. Animal studies report it acts as an endocrine disruptor and interferes with hormone activity. You’ll find this one in many antibacterial hand soaps and hand sanitizers. But it’s also used in deodorants, skin cleansers, and toothpaste. It’s another endocrine disruptor that harms your thyroid and reproductive hormones. 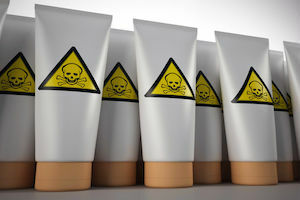 You’ve probably seen a slew of products marketing themselves as “paraben-free”. These chemicals mimic estrogen and lead to hormone imbalance. Now, CDC reports suggest their presence in every American’s body. Whether they are or aren’t, avoid products with parabens to prevent reproductive problems like infertility or slowed growth and developmental disorders in children. Also called perfume, these terms indicate a mixture of ingredients that cosmetic companies don’t have to legally tell you about. Three thousand or more chemicals may be used to create a fragrance. Some “Unscented” products contain fragrances with masking agents. Some fragrances have been linked to allergic reactions, asthma, and breathing difficulties while others have links to cancers. Used in mascara, these ingredients come from oil refineries and often contain impurities linked to cancer. These, and similar ingredients labeled as “methicones”, soften and smooth skin. They also disrupt your hormones and interfere with fertility and libido. Used in nail polish, toluene is also used in paint thinners. Research suggests it interferes with the human immune system and may be tied to the development of malignant lymphoma. These vitamin A compounds are not safe for skin use. Sunlight breaks them down and creates free radicals that increase the risk of skin cancers. Avoid all skin and lip products with any of these vitamin A chemicals. Many cosmetics now use nanoparticles to deliver chemicals to the surface or even into the skin. Many of these products have not been evaluated for safety. Some are even used in sprays that make it possible for particulates to enter your lungs and blood stream. First, don’t buy or use any cosmetic product, cream, sunscreen, ointment, or lotion that has any of the ingredients listed above. This may take a little work, but you and your family will be far better off in the long run. Next, do a little research online. Take a little time and research products that not only claim to use natural, organic products, but have ingredient lists that support their marketing. Find out where you can buy these. Many of the best, safest, and “real” natural skin lotions and cosmetics can be bought online, saving you time and travel. For your most delicate skin, I personally recommend Parfait Visage®, an all-natural facial cream that contains no synthetic preservatives. For more information and as a great comparison label, view this ingredient list of a natural and organic skin care product. Parfait Visage® makes your skin look younger! Essential oils combined with vitamins and other nutrients help restore natural fluid and lipid balance to your skin. Parfait Visage® is 100% natural, organic, and contains NO synthetic preservatives.